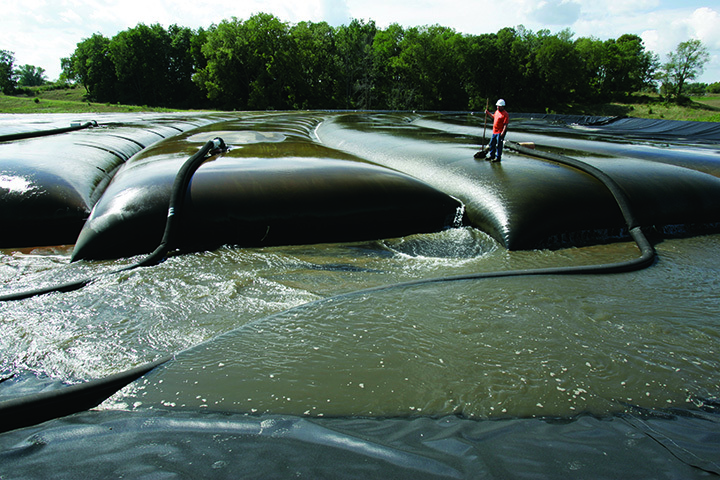 Geotube® containers are a cost effective method for dewatering sludge, tailings, or dredging spoils. Geotube® units or containers are manufactured with special high strength woven geotextiles and are a very cost effective option in dewatering applications, dredging and structures along shorelines. Geotube® units are available in various sizes and may be supplied large enough to hold over 900 cubic metres of material each. In dewatering applications, Geotube® units are filled with sludge slurry with water added, if needed to allow for easy pumping. The excess water then filters through the walls of the unit leaving the solids trapped inside. This reduces the amount of high cost liquid material to be disposed of leaving solids that are easily handled. In shoreline protection applications, Geotube® units are typically installed with a scour apron which connects the large tube to a smaller anchor tube. After filling, the Geotube® unit is then covered with sand, rock or spray on coatings. Design assistance is available to determine sizes, stresses, stacking arrangements, and estimate dewatered volumes and pumping days.